Dionisius led the Moscow school of icon painters at the turn of the 15th and 16th centuries. Dionisius painted very much in the manner of Doménikos Theotokópoulos (1541 Crete – 7 April 1614), a Spanish Renaissance painter, sculptor and architect known as “El Greco” because of his Greek origin. Icons are religious works of art practiced by the Eastern Church and dating back to the early days of Christianity. By and large, these icons are stylised. Icons portraying the Virgin and Child resemble one another. In the Eastern Church, the Madonna is called the Theotokos, meaning the Birth-Giver of God. Before the Fall of Constantinople, on 29 May 1453, several icons were made in Constantinople, the capital of the Christian Byzantine Empire. The Byzantine Empire, however, fell to the Ottoman Empire. Therefore, Greek scholars fled to the West, inaugurating the Renaissance, while others fled East, to Russia, hence the Moscow school of icon painters. 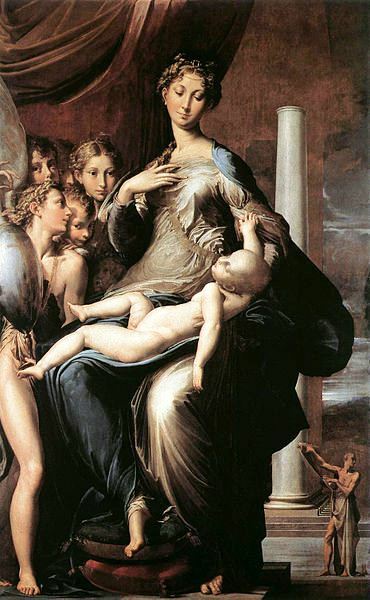 It would appear that Mannerism, a style characterized by the elongated limbs of the subjects it portrays, exerted an influence on the art of Dionisius who is referred to as manneristic, “Muscovite mannerism.” However, a better example of mannerism is Parmigianino‘s Madonna with the Long Neck, painted in the 1530s (1534-1540). Under Wikipedia’s picture of Parmigianino’s Madonna, the author writes that mannerism “makes itself known by elongated proportions, highly stylized poses, and lack of clear perspective.” (Mannerism, in Wikipedia). We have now left the sober art of Leonardo da Vinci, Raphael and the early art of Michelangelo. In short, Dionisius may have brought to Russian icons the mannerism of certain late Renaissance works of art, but it could be that icons associated with “Muscovite mannerism” resemble earlier icons of the Theotokos, such as the very famous Theotokos of Vladimir, shown below. Given the length of the child’s neck, one suspects a significant degree of continuity.